This is available for purchase on my Daily Paintworks site starting 11/17/13! Please click here to purchase. The Notan on the far right is what I ended up using and has the simplified dynamic symmetry markings. © 2013 R.L. Delight wave study and final painting. If you read the post about Wave Study #66 you might remember that the rain started to interfere with the paint causing it to not want to stick to the canvas. I raised the horizon line slightly and changed the shape of the wave a bit but, the colors and the wave shapes are fairly close. 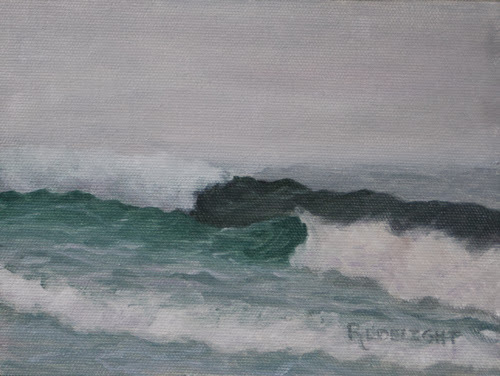 I decided to call this The Gray Effect because the gray misty light brings out colors in the ocean waves that are usually only seen when the day is dim and filmy. The waves also take on an inner glow which I had a great deal of fun trying to achieve. Not sure I hit it but I did enjoy the challenge. I am still a bit behind but things are moving forward and are falling in place. I am ready for the new week! Very nice and thank you for including some of the inner workings on artistic choice. Concept and words new to me too, always a plus! 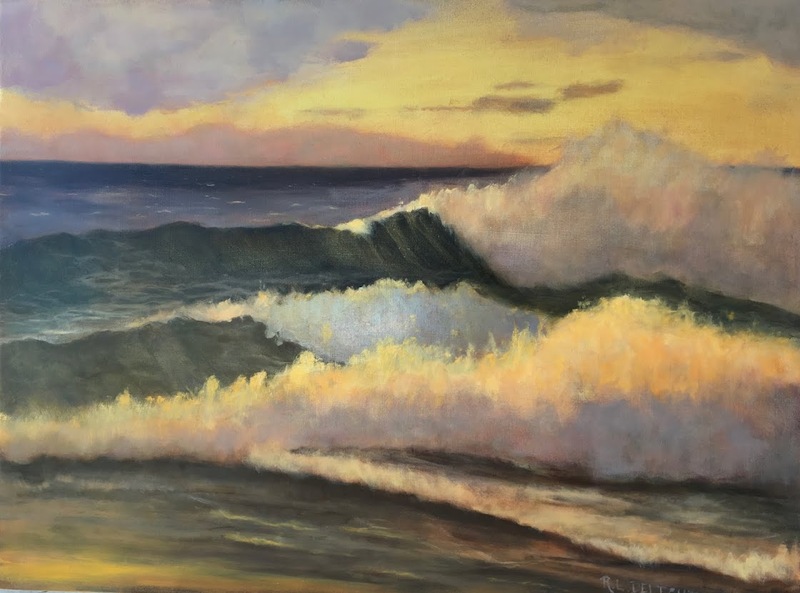 I love the glow you are getting on those waves BTW, and I can see the colors becoming more complex through the studies. What a lovely palette too in the last post. Those rich earthy colors always grab me. Hi Theresa and thanks for the comment! I am glad you like the technical details too. I always struggle to find a balance with what I am enthusiastic about and what makes other's eyes glaze over. My weaving and dyeing experience adds a wonderful resource to tie into when playing with color. I love it.